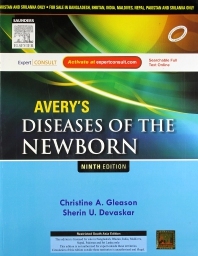 Avery’s Diseases of the Newborn, edited by Christine A. Gleason and Sherin U. Devaskar, is a practical, clinical reference for diagnosing and managing of all the important diseases affecting newborns. Thoroughly revised by a team of new editors, this edition provides new perspectives and updated coverage of genetics, nutrition, respiratory conditions, MRSA, neonatal pain, cardiovascular fetal interventions, care of the late preterm infant, and more. You can also access the fully searchable text and downloadable images online at www.expertconsult.com, making this authoritative reference ideal as a clinical resource or subspecialty review tool. Treat newborns effectively with focused coverage of diagnosis and management, including pertinent developmental physiology and the pathogenesis of neonatal problems. Meet every challenge you face in neonatology with Avery’s authoritative, comprehensive clinical resource and subspecialty review tool. Navigate quickly and easily with extensive cross-referencing throughout the organ-related sections.